The day the children started cleaning the bricks was magical for me. I’m not exactly sure how it started. One moment there was a pile of old used bricks covered in hardened mortar, and the next there was a production line of workers meticulously hammering and chiselling the mortar off, piling the bricks into countable piles and checking for quality control. It was even more organised than that, with a boss giving out jobs and instructions and organising breaks for the workers to run around the forest in turn and rest tired hands. The enthusiasm around the bricks project even spurred one of our first small meetings which required everyone’s presence despite being in the middle of the day. This meeting was called and led by the boss of the operation, who is usually quite reserved in meetings. But he called this meeting because he had a purpose. His purpose was to convince the group to change their afternoon plans and all walk to Sydenham to buy a bag of mortar so that his team could start construction. The meeting was a tense one. Some of the children who were not involved in the project were busy with their own work/play and did not fancy interrupting it to walk to Sydenham. Sally and I were unprepared at that point to split the group with one of us accompanying the expedition and the other remaining at Dacres’ Wood, as the procedure for such a division was not established. The meeting was concluded with the decision to buy mortar for the following day. This at first seemed like a disappointment for the construction team, but very soon it seemed to fuel a new phase of energetic work as they set out to clean 100 bricks before the end of the day; enough to commence their construction work the following day. And unsurprisingly, by pick up time, 102 bricks had been cleaned and piled, ready for use. And if you’ve ever cleaned a used brick, you’ll know it’s hard work! The following day, we bought a bag of mortar and surely enough the construction started. Sally spent the day with them, working behind the garage, watching YouTube videos and reading instructions on the mortar pack. Firstly, they set out to build a small wall, and worked out that overlaying bricks so that each brick overlaps two below it makes for a stronger hold. The wall was laid to rest overnight and was solid the next day. I’m not sure what caused it, but the following few days there was a lull in the brick project. I feel like this may have been a needed moment of absorbing what they’d been doing, taking time to plan what to do next, and give themselves time to return to forest play while the next phase emerged. I think this lull is natural and needed. I sense it in myself at times when I start a new project. I get completely engrossed, then take some time out, and then return to it with fresh eyes and energy. Or perhaps the lull was caused by other activities, visits, hostings, play happening at the time which took precedence. But either way, when this happened, instead of holding back and letting the process see itself through, I stepped in. It was mid-winter and I’d been thinking about preparing a site to plant in come spring. We didn’t have a growing site and had talked to the conservation officer from the council, about the possibility of growing plants on the south facing wall behind the garage. I was considering the options for this one day and remembered the construction site behind the garage, and of course, that seemed to me at the time to be the perfect fit – I’d propose that we build a raised bed using the bricks! The next day, I proposed this to the construction team in the meeting and they all agreed. I’ve thought about this a lot in terms of how our meetings function. Sometimes proposals are made quite quickly and decisions are reached immediately. Normally in roundspeak there’s an opportunity to go around the circle and hear people’s thoughts about a proposal before we all get a chance to agree or object. But it’s not always easy to know how you feel about something immediately. It could seem like a good idea at first. The construction team didn’t at that time have a clear idea of what they wanted to build, and this maybe seemed like it would give them direction. Or maybe they saw that I was enthusiastic about it and so decided to go with it. At any rate, when we went around the circle, no one objected to the proposal, and so, we started work on the raised bed. We spent a day working on it, and it was more complicated than first anticipated. The bed needed to have drainage and we had to protect the garage wall from water damage. The team working with me had more experience than I had, having previously successfully built the model wall, so I followed their lead in laying out the bricks and the mortar. We also used our new DIY book which was given to us by one of the parents to get extra tips. We built the base that day and stopped as we needed to run the design past the conservation officer to get approval. But once the design was run by the officer, I felt that the team’s enthusiasm for the project had fizzled out. I brought it up as my plan in the meeting a few times, but there weren’t any takers to join me. In theory I should be able to do my own project at Dacres’ Wood even if children don’t join me, but in reality it’s difficult to do that behind the garage as that renders me effectively absent for most of the day. And so, the first two layers of brick on the raised bed were left fallow for the next two months. The brick project lost some momentum then. Occasionally some of the children would use the cleaned bricks to build walls and small dens, but these were un-mortared temporary constructions. It was unclear to me whether this was a natural learning rhythm, or whether my actions had somehow taken the cement out of their sand, or whether it was a lack of technical expertise and sure planning permission which got us to where we were. Until the open day. Again, I’m not sure how it started, but towards the end of the day some of the children started clearing bricks, and once again there emerged a production line of cleaned bricks. This time new children and visiting children wanted to have a go and the work had a different feel to it. The following Wednesday, I announced during plans that my plan for the day would be to take down the raised bed and clean those bricks again ready for re-use. The team said that they wanted to build a house, and as if my magic, that very week, a friend of FWG who had expressed interest in the hosting space emailed me offering to visit to do some bricklaying with the children. The day this friend visited to show the children how to lay bricks felt like another magical day. I think sometimes adults get worried about things which children are a lot less concerned by, and one key facilitator skill I’m working on is my ability to recognise when a problem is my own, and not to burden the children with it. 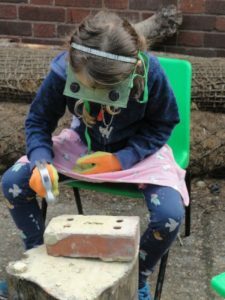 That day I remember being somewhat preoccupied with the concern that every child who wanted to would be able to access the bricklaying workshop. We had 10 kids in that day, the space behind the garage is pretty small, and many more children than originally involved in the project looked keen to join in. I was also aware that the children needed space to repossess the project without my interference. So I stood back. In the morning, the children sat in a circle and together planned out their dream house, with a garden, a balcony and a fire escape tunnel. They then set about cleaning the site, and every child had a role; moving bricks, tidying the rubber tiles, sweeping, dusting, cleaning more bricks, knocking down the model wall, preparing the site for the new construction. Once the construction started, again, roles were created and assumed, and there were plenty of them. Measuring the mortar, pouring water, mixing it, using the trowel, laying the mortar, using the spirit level, laying the bricks, knocking the bricks into place, cleaning more bricks, sweeping the new mess that was being made, drawing out architectural plans, finding your favourite wig, being the king, finding a costume for the king, determining what powers the king has, narrating the story of the king, deciding if you wanted to serve the king or obstruct him, creating passwords, guarding the workspace, changing the password, changing of the guard. That sounded like an invitation. It was an invitation. And soon enough, I was on probation. They set me to work doing a task which they needed an adult for. I held the bricks which were being mortared up so that they could access them more easily to mortar. Once I’d proven my worth, they whispered the password into my ear. I had never asked for it. There are so many worries we carry with us as adults, and to hold a space for children where they can truly direct their own learning, and create their own culture, takes both trust and time. Things sometimes move at a different pace in the children’s world than it does in the adult world, and being facilitators, we learn to recognise that and make room for it. This is especially important as things can go at different paces for different children! We adults might get anxious to see things moving along, but they do, when they’re ready to. And when the trust is there, then all sorts of ways emerge. I was worried that there wouldn’t be enough space for everyone that day, but the children created enough jobs and roles for each and every one of them, with no fuss at all. They even found a job for me. Previous PostPrevious Are gorillas grown up monkeys? Free We Grow Ltd. is a company based in South East London, offering an alternative education space which functions on democratic and humanistic principles.